This 15 minute marinade was very easy to throw together and took no time on the grill. Great for a weeknight dinner! I used thinly cut pork chops but chicken would also be great. 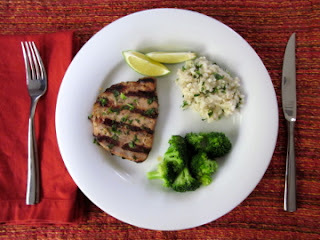 I served this with brown rice tossed with lime and cilantro and broccoli drizzled with toasted sesame oil. This recipe was good as is but next time I might tweak the ingredients to really bring out the sesame and ginger. Combine all of the ingredients for the marinade in a medium sized bowl. Place the pork in a 9 x 13 glass dish or resealable plastic bag. Pour the marinade over the pork and marinate for 15 minutes, flipping the pork chops over half way through. Grill the pork chops over med-high heat for 3-5 minutes per side or until the center is no longer pink. Baste with extra marinade during grilling, if desired. Let rest 5-10 minutes before serving.